I have not hiked the entire 10 miles of the Mason Tract Trail yet, but I thought I would get a start on this page anyway. I have hiked the southern half of the trail, from Chase Bridge Landing to past the Castle Landing twice. Update, in the spring of 2014 I completed the north half of the trail twice. Here’s a blurb from the Michigan DNR about the Mason Tract…A 4,493 acre special management area along the South Branch of the Au Sable River designed to protect the quality fishing waters of this area. The Mason Tract originated from acceptance of a 1500-acre gift from The George Mason family in 1954. Over time, additional acreage has been acquired from the US Forest Service and private individuals through land exchanges. The Mason gift was contingent the area be used as a permanent game preserve, no part shall ever be sold by the state, and no camping be allowed in the area for 25 years. The State of Michigan has continued the no camping restriction in the Mason Tract. The only camping allowed is within Canoe Harbor State Forest Campground, located at the north end of the Tract on the Au Sable River. 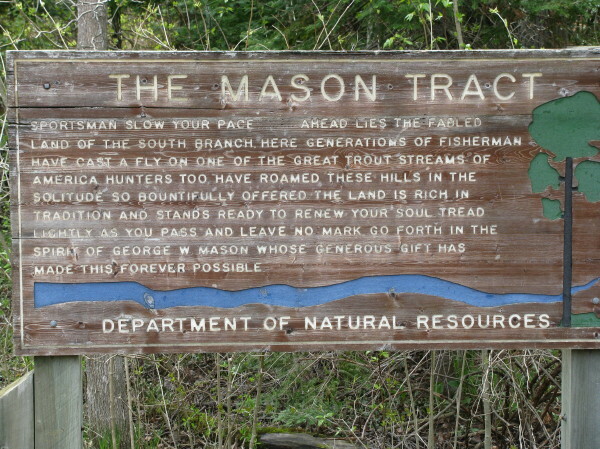 The Mason Tract offers quality fishing, hunting, and canoeing opportunities. The Mason Tract is home to the pristine Mason Chapel. The Mason Family constructed the Chapel in 1960 to provide fishermen with a place of reverence and has developed into a popular tourist attraction. The Mason Tract also contains the Mason Tract Pathway, which is used for hiking and cross-country skiing. Mountain biking on the Mason Tract Pathway is prohibited via a Director’s Order. 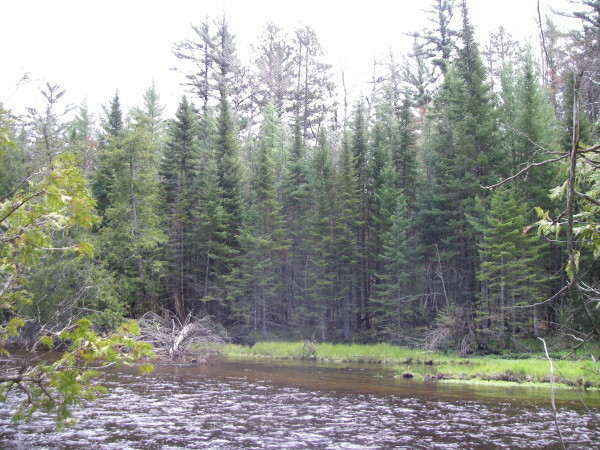 This is a special place for me, because it does protect the gorgeous south branch of the Au Sable River, which I love to fish. The trail itself is beautiful, offering many great views of the south branch as it winds its way northward to join the main stream of the Au Sable. The trail is well-marked and easy to follow, and easy to hike. It winds through a mixture of forest types, from wetland cedar marshes, some old growth pines, and mixed hardwoods in different places along the river. The trail is popular with cross-country skiers and snowshoers in the winter, but is closed to mountain biking. The river is also popular with canoeists and kayakers, and there are several landings on the river which also access the trail. One thing I would like to do someday is to hike the trail on a Saturday, then run the river in my kayak on Sunday. The only place where camping is allowed in the Mason Tract is Canoe Harbor Campground, that was exempt from Mason’s camping ban because the area was federally owned at the time of the original gift. 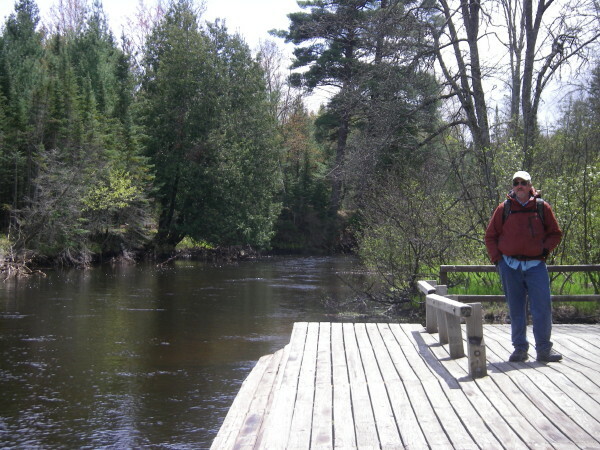 The state forest campground has 54 sites for tent and small trailers and 10 canoe group campsites as well as drinking water, vault toilets, and a canoe landing on the river. Me at the Castle landing while hiking the Mason Tract. The trail takes you past where “Durant Castle” was being built. During the late 1920s, William Durant, who amassed a fortune as president of General Motors, started construction on his own personal castle in northern Michigan, along the banks of the Au Sable River. Just before he moved in, however, the castle burned to the ground. This event was suspected to have been an act of arson, allegedly by the hands of the fledgling UAW, whom Durant refused to acknowledge as a union. All that’s left is some of the exposed foundation of where the castle used to stand. Also in the Mason Tract is the Mason Chapel, built in the 60’s by the Mason family for use by fishermen. It is on the other side of the river from the trail though. To get there from Grayling, take M 72, which is South Down River Rd. east to reach the entrance to the Mason Tract posted at Canoe Harbor Road. Turn south (right) on this dirt road and a parking lot and large trail sign soon appears to the east (left). 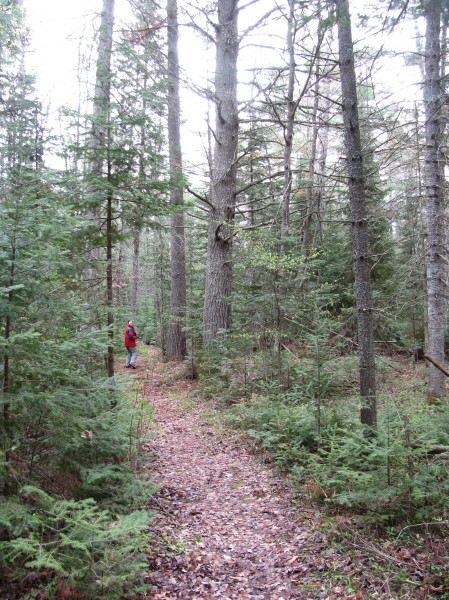 If you continue on the dirt road past the trailhead, within half mile, you will pass the posted entrance to Canoe Harbor State Forest Campground. Alternately, you can turn south (right) on Chase Bridge Road before you get to the northern trailhead if you prefer to hike the trail from south to north. The trailhead on Chase Bridge Road is just after the bridge over the south branch of the AU Sable. This is a very popular area in the summer, too popular for my tastes. A large number of kayakers and canoeists will be on the river all weekend long, although I don’t think the trail gets as much use. While most people go there from Memorial Day to Labor Day, for me, it’s the other way around due to the crowds on the river. A chapel in the woods, a place for spiritual inspiration, where we can reflect on the nature of our lives amidst the depths of woods & holy waters of the Au Sable It’s a gift from Mr. Mason, offering to all generations a spot and time to find our sense of place. I feel it’s a sin the way the DNR is neglecting its entrusted responsibility to care & preserve “The Chapel in the Woods”. I’m ashamed of the DNRs failure to maintain basic care of this site, especially in light of its purpose as a chapel. A higher level of care by the DNR for the condition of the chapel needs to be indicated to the general public. The public perception of wild abandonment encourages a “No One Cares” attitude, and negative behaviors towards the chapels wellbeing. Care for the chapel by the public will only come with increased care for the chapel by the DNR. No major operations, just some TLC in the form of repairs, clean, inform & oversight. DNR needs to pick up its game in caring for The Chapel in the Woods, after all its much more than just a physical structure. So let’s get busy, God is watching .and waiting, and so are we. Your so very right Jim, the DNR should maintain the chapel much better than they do. I have fears that they let cherished things like that slide, hoping that the private sector will step in and take over the maintenance of those things.